The online registration of preSUSY is over. We do not accept registration any more. Attendance of PreSUSY08 is free of charge. Accommodations and meals are provided for the PreSUSY08 school days. Pre-SUSY08 school will be held during June 12-14, 2008 at the KIAS. The school delivers a series of introductory lectures for those who have not been working on all the aspects of exciting physics involved with the LHC, astrophysics and cosmology. Click on the agenda to get the talk files. Size of some files are more than 10 MB. The school will be held at the KIAS International Conference Hall on the KAIST Seoul campus. Note that the location of the pre-SUSY08 school is different from that of the SUSY08 conference. For more information, visit the following links. Check the Google satellite map. We recommend the participants to use a airport limousine bus from the Incheon international airport. Please take the airport limousine bus 602 at the station 5B, 12A and get off at the Dongdaemun-station stop. The fee is 9,000 won (KRW). Then go to the Ulji-Ro COOP residence either by walk or by taxi. The distance from the bus stop to the COOP residence is about 1 km. See the map below. 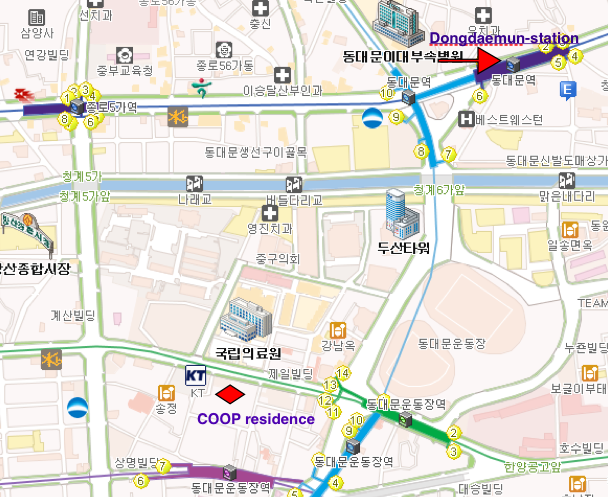 Download the map for taxi driver to Ulgiro COOP residence. How to arrive at KIAS: take the subway Line No. 4 and transfer to Line No. 1 at the next station, Dongdaemun. You get off at the 4th station, Hoegi, from which KIAS is within 10 minutes walk. Directions can be found in the above link.